Heat oven to 375°F.Spread cheese evenly in bottom of piecrust. Topwith filling in an even layer. Beat eggs, salt, and thyme in medium bowl until blended. Carefully Pour over filling in piecrust. Bake in center of 375°F oven until center is almost set but jiggles slightly when dish is gently shaken and knife inserted near center comes out clean, 30 to 40 minutes. Let stand 5 minutes Cut into wedges. An outstanding basic cheese quiche recipe relies a lot on a few simple tips and tricks. 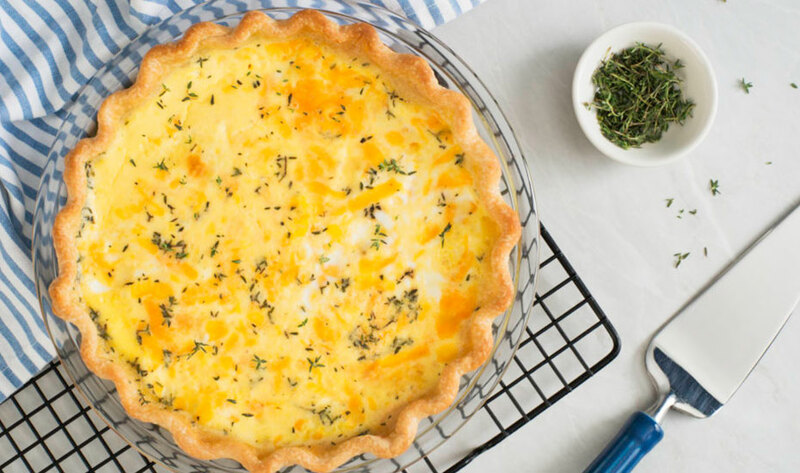 Learn how to make cheese quiche with our insider tips. The French-inspired quiche is a perfect light lunch or dinner. Try adding chopped fresh herbs, such as parsley, basil or oregano. If using frozen piecrust choose the deep-dish size. Always bake your pie shell first to avoid a soggy crust. For a non-traditional “crust”, mix cooked rice, orzo, spinach or hash browns with a beaten egg and press it into a greased quiche dish or pie plate. Individual egg and cheese quiche can be baked in pastry tart shells, muffin tins or hollowed out vegetables. Make fillings from your favorite foods or from leftovers. Use a combination of cheese, meat, seafood or poultry and vegetables. Some classic filling combinations are Cheddar cheese and ham or sautéed onion, bacon and Swiss Gruyere cheese. No water bath needed. The pie crust protects the custard filling from direct oven heat, so a water bath is not necessary. How to tell if the egg and cheese quiche is done. Baked custards should be removed from the oven before the center is completely set. The center will jiggle slightly when cup or dish is gently shaken. Custard will continue to “cook” after it’s removed and center will firm up quickly. Overbaked custard may curdle. The knife test: Test for doneness with a thin-bladed knife. Insert knife about 1 inch from the center of a one-dish custard; midway between center and edge of cups. If knife is clean when pulled out, the custard is done. If any custard clings to the blade, bake a few minutes longer and test again. Cheese fillings: Quiche fillings containing cheese may continue to test “wet” even after they are done. Tap or gently shake the dish; remove quiche from oven when the center is almost set but still jiggles a bit. For a richer custard, substitute half-and-half for the milk. Need a party appetizer? Bake quiche in a square or rectangular pan; cut into small squares or triangles. Or bake in mini muffin cups.